Thumb Butte is a distinct landmark located just west of downtown Prescott. The area surrounding the butte is filled with hiking and biking trails that wind through the Prescott National Forest. The terrain is quite rugged with climbs and descents into the area's numerous hills and drainages. The varied terrain is an excellent place to practice your navigation skills. Click here to automatically open a browser window to a Google Maps webpage with a marker at the Big Juniper event site. Enter your starting point in the starting address box. The event site is about 300 meters down Forest Road 51. FR 51 is rough but accessible to passenger cars. Park along the side of FR 51. Please keep the road clear and leave space for other vehicles to park. From the I-17/Loop 101 interchange in North Phoenix, travel north on Interstate 17 approximately 47 miles to Cordes Junction exit 262. Exit I-17 at exit 262. Stay in the left lanes to merge onto AZ highway 69 towards Prescott. Continue north and west on AZ 69 approximately 35 miles to downtown Prescott. Highway 69 and 89 merge just before Prescott. Stay in the left lane as you approach the intersection with Highway 89. The road turns into East Gurley Street and goes by Courthouse Square and Whiskey Row (mile 0). 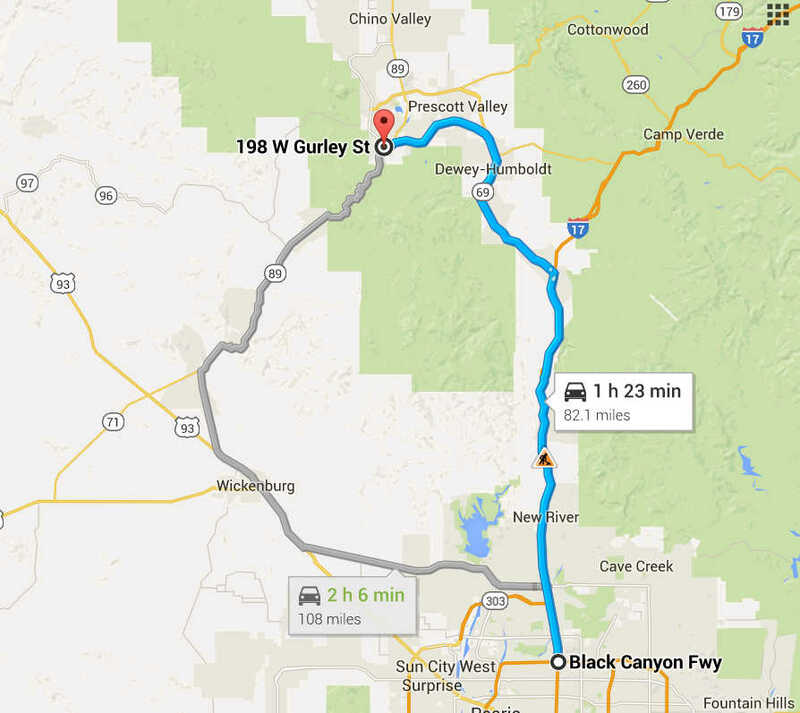 From Courthouse Square, travel west on Gurley approximately 1.4 miles to where Gurley becomes Thumb Butte Road. 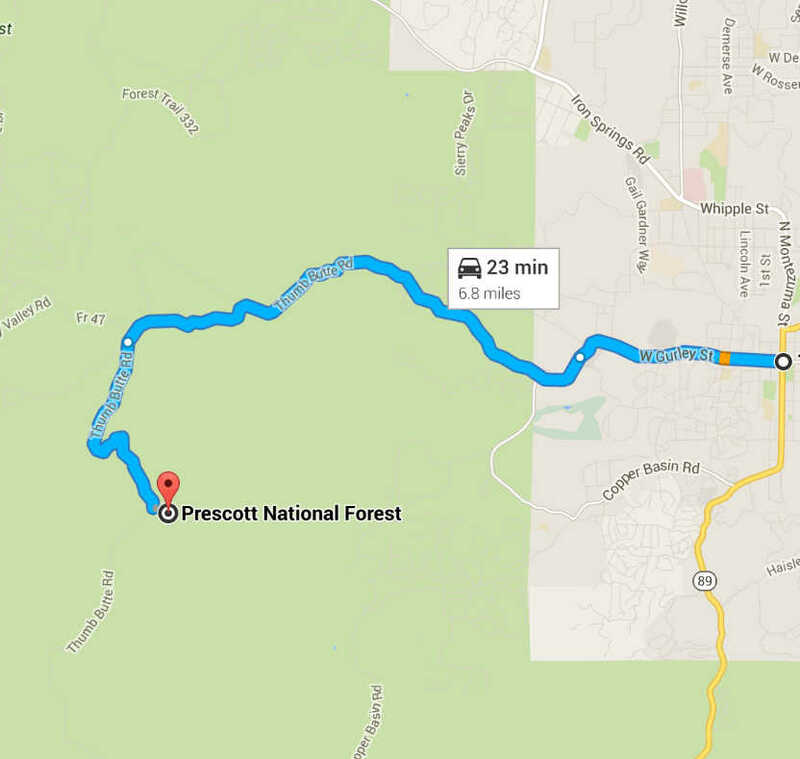 Keep left on Thumb Butte Road and continue west for an additional 2.1 miles to the Thumb Butte Park Recreation Area. After arriving at the Thumb Butte Day Use Area, continue on Thumb Butte Road for approximately 1.8 miles to the intersection with Forest Road 373 (FR 373). Turn left and travel south on FR 373 for approximately 1.8 miles. The road will crosses a small creek and climbs a large hill. After the terrain levels off, look for orange and white orienteering signs at FR 51. Take a left onto FR 51 and travel to the event site about 300 meters down the road. FR 51 is rough but accessible to passenger cars. Park along the side of FR 51. Please keep the road clear and leave space for other vehicles to park. Click on a map below to open an equivalent Google map in a separate window.